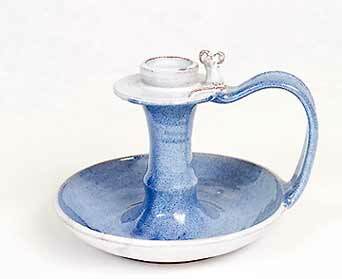 Jill Pryke candlestick - 4" (101 mm) high. Jill Pryke studied at Wimbledon Art School and became a teacher of arts and crafts. From the mid-sixties she potted in her garage at home in Hassocks, Sussex, selling her pots through craft fairs and one or two shops. In 1975, with her husband Michael, she opened a shop in nearby Ditchling and continued there, at various addresses until 2002. She continues to make pots at home in Hassocks.